When it comes to finding legitimate work from home jobs, it is definitely not an easy task. There are a numerous amount of job sites on the internet now than ever before. Search through them ALL. Not just the ones with big name, but the small ones as well. Try searching geographically too! Do not limit yourself. When searching for legitimate work from home jobs, make sure to ask questions. If the job posting is limited with information, contact the poster and gather as much information before going any further. Find out how much the job paying: Is it Hourly or commission based? Also ask how often you get paid, and what equipment is required to do the job. With work from home jobs, the main communication is done online, so make sure you are perfectly clear of what is expected and have knowledge of red flags to avoid. 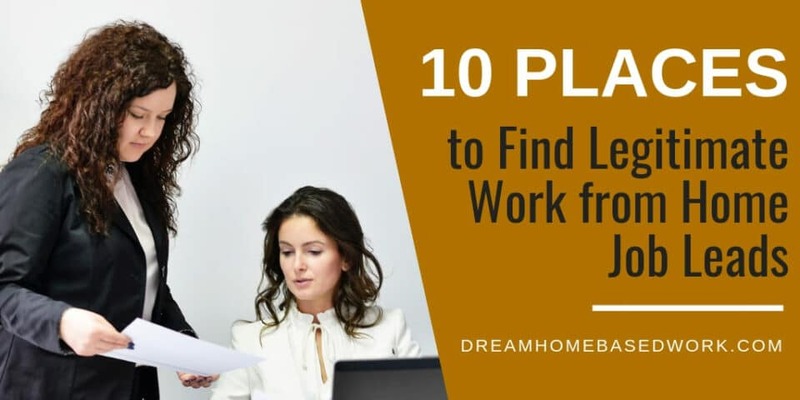 I have gathered a list of where to find legitimate work from home job leads around the web. Some of you may have visited a few, but hopefully you will find some new ones to bookmark as well. All of these sites are highly recommended. So make sure to visit these sites daily to help you on your work at home journey. 1. My Work at Home Job Board – On this page, you will find my official job leads board that is updated six times per week. Make sure to bookmark this page to stay in the loop of fresh work at home opportunities for US residents and worldwide jobs. 2. Rat Race Rebellion – Rat Race Rebellion shares at least 10 new work at home job leads – six times per week. They make sure to carefully screen each company before posting. Visit their job board here. 3. Work at Home Mom Revolution – Author, Lisa Mills, started “Work at Home Mom Revolution” in 2007. Lisa shares daily job leads, including tons of information on the job location, requirements and pay structure. 4. FlexJobs – This is a huge membership site with tons of job leads, work at home information and resources. All jobs are scanned for 100% legitimacy. 5. Real Ways to Earn Money Online – Author, Anna Thurman, started “Real Ways to Earn Money Online” in 2010. This is an awesome blog I personally visit several times per week. Anna gives you exclusive information on work at home companies, job leads board, and various ways to make money online. 6. The Penny Hoarder Job Board – This credible site shares legitimate work at home job leads several times per week. They make sure to carefully screen each company before posting. Visit their job board here. 7. 1099 Mom – Lindsey shares daily job leads, including tons of information in the following fields: Customer service, education, writing, and technical support. 8. The Work at Home Wife – This blog was started by Angie Nelson, who primarily focuses on helping individuals who want to make and save money from home. Angie also has a “job leads section” that is updated a few times per week. 9. 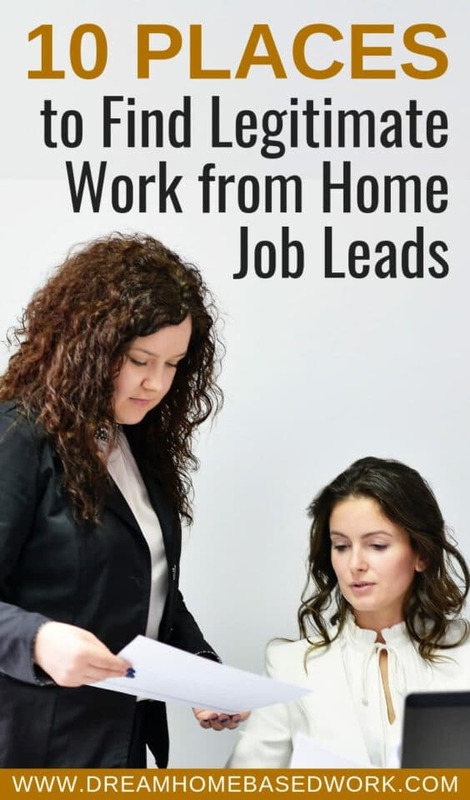 Work from Home Happiness – This is a fairly new blog, where Ashlee shares all kinds of great information, including a “job leads board ” that is updated several times per week. You can also find her on Facebook, where she gives the inside scoop on who's hiring and extra ways to make money from home. 10. WAHM.com (Forum) – WAHM.com is the largest work at home forum, that has a telecommuting section for work at home job leads. This site also has a job board filled with a variety of work from home opportunities..
Be smart when researching, and be open to all available tools out there. Remember that there is hope and the job of your dreams can be found. Just be realistic and patient. This is a great list! Thanks so much for the mention!